In a moment that many in the tech industry have been waiting for, Snap finally filed its public IPO papers Thursday, revealing a host of information about the notoriously secretive company. We dug through the filing and pulled out some of the more interesting tidbits, including revenue numbers and user growth numbers, as well as some surprising factoids, like unique information around voting shares. The Los Angeles area company will be listing shares on the NYSE under the symbol SNAP, confirming rumors that broke early this week. The target amount for the offering is $3 billion, which is about 66% larger than the $1.8 billion it raised in its last private financing in May 2016. In a surprising move that some caught wind of early, the Class A shares that will be issued via this IPO will not come with any voting rights—the company’s other two classes of shares, Class C and B, command 10 votes per share and one vote per share, respectively. While there are many companies that have non-voting shares, Snap claims its IPO will be the first to issue all non-voting shares on a US stock exchange. Also disclosed in the doc is that the two co-founders, Evan Spiegel and Robert Murphy, control a substantial portion of the Class C stock, so much in fact that they potentially have the power to control any and all matters submitted for stockholder approval. Although it’s not terribly uncommon for founders to format voting rights in such a way that they maintain control post-IPO (Mark Zuckerberg to this day can, for the most part, still do as he pleases), it’s extremely uncommon for companies to issue shares that hold no voting rights. It’s also revealed that if either co-founder is fired from the company, he would maintain his voting power. Snap boasts 158 million daily active users that open its app an average of 18 times per day, spending an average of 25 to 30 minutes in total engaging with the app. Of those DAUs, 60% create Snaps with the camera every day, 60% use its chat service each day and 25% post to their "story" each day. While 158 million DAUs is nothing to shake a stick at, Snap has been experiencing slowing growth in its user base, particularly following the launch of Instagram's Stories, which may be concerning to some investors. 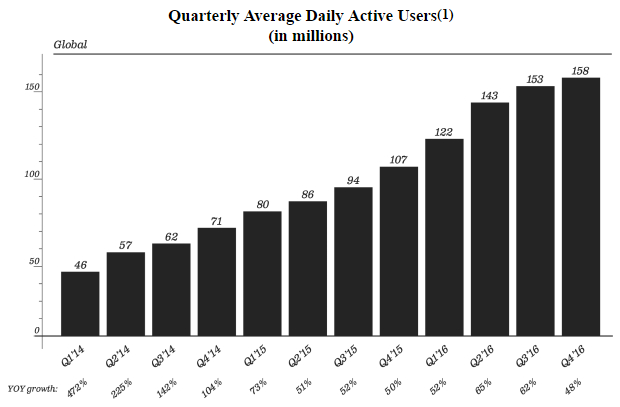 In the last quarter of 2016, Snap added just 5 million new users globally, the smallest QoQ increase in over two years. What’s perhaps even more worrisome is that all the user growth in 4Q 2016 came from the US and Europe, with the company adding a none material number of new users in the rest of the world. Snap recorded $404.5 million of revenue in 2016, representing a sizeable 590% increase from 2015. 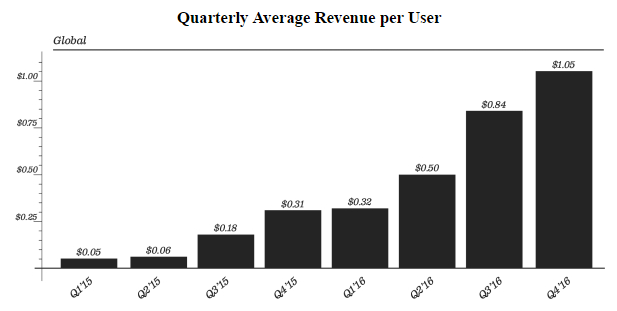 Average revenue per user last year sat at $1.05, up 3.4x YoY. That said, net loss is also on an upward trend, increasing from $372.9 million in 2015 to $514.6 million in 2016, 38% uptick. Snap’s co-founders, Spiegel and Murphy, each own 21.8% of the company. Early investors Benchmark Capital and Lightspeed Venture Partners own 12.7% and 8.3%, respectively. According to the PitchBook Platform, other VC backers include General Catalyst, Institutional Venture Partners, SV Angel, Graph Ventures, Entrée Capital, New Enterprise Associates, GSV Capital and Kleiner Perkins Caufield & Byers. Some nontraditional investors consist of Coatue Management, Grupo Arcano, GIC, Rizvi Traverse Management, Alibaba, Yahoo, York Capital Management and Fidelity Investments. • The company just recently established the Snap Foundation. After the offering, Snap and its co-founders pledged to donate up to 13,000,000 shares of our Class A common stock to the Snap Foundation over the course of the next 15 to 20 years. They anticipate "the proposed programs of the Snap Foundation will support arts, education, and youth." * a previous version of this article misstated Snap's 2016 revenue as $405.5 million. It was $404.5 million.